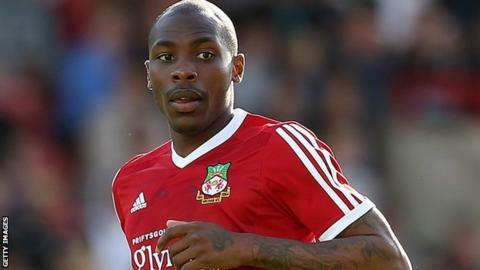 Wrexham survived a late rally from 10-man Kidderminster to secure a third successive National League victory. The visitors looked to be coasting after Manny Smith's far-post header and Sean Newton's top-corner free-kick gave them a deserved advantage. Kidderminster lost Reece Styche to two yellow cards in three minutes for clashing with Smith, but Andre Wright's header gave them a glimmer of hope. Wrexham held firm and Adam Smith's stoppage-time lob sealed the win. "I had a nervous 10 minutes, I've got to be honest, because 2-0 is always dangerous. When we went two up we let it slip a little bit and we gave them a goal by not picking up at the back post. "It was a nervous time then, so it was great to see that third goal go in. It's another three goals, and away from home as well. "I thought it was an excellent performance and showed another side to our game - if we have to mix it, we've proved we can do that." Match ends, Kidderminster Harriers 1, Wrexham 3. Second Half ends, Kidderminster Harriers 1, Wrexham 3. Attempt missed. Adam Dawson (Kidderminster Harriers) right footed shot from outside the box misses to the right. Goal! Kidderminster Harriers 1, Wrexham 3. Adam Smith (Wrexham) right footed shot from outside the box to the bottom left corner. Assisted by Cameron Belford. Attempt blocked. Rob Evans (Wrexham) right footed shot from outside the box is blocked. Substitution, Kidderminster Harriers. Craig Reid replaces Jared Hodgkiss. Attempt missed. Andre Wright (Kidderminster Harriers) right footed shot from outside the box is too high. Attempt missed. Adam Smith (Wrexham) left footed shot from outside the box is too high. Foul by Andrew Fox (Kidderminster Harriers). Substitution, Wrexham. Kayden Jackson replaces James Gray. Attempt saved. Adam Smith (Wrexham) right footed shot from outside the box is saved. Goal! Kidderminster Harriers 1, Wrexham 2. Andre Wright (Kidderminster Harriers) header from the left side of the box to the bottom left corner. Assisted by Adam Dawson with a cross. Foul by Adam Dawson (Kidderminster Harriers). Substitution, Kidderminster Harriers. Andre Wright replaces Aman Verma. Attempt saved. Aman Verma (Kidderminster Harriers) header from the left side of the box is saved. Assisted by Adam Dawson. Attempt saved. Gurjit Singh (Kidderminster Harriers) header from the right side of the box is saved. Assisted by Andrew Fox with a cross. Attempt missed. Javan Vidal (Wrexham) left footed shot from the right side of the box misses to the left. Attempt blocked. Andrew Fox (Kidderminster Harriers) right footed shot from outside the box is blocked. Attempt saved. Aman Verma (Kidderminster Harriers) header from the right side of the box is saved. Assisted by Joe Clarke with a cross.